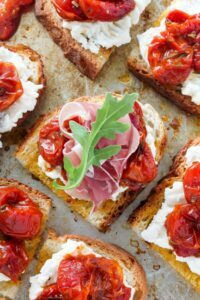 Flavorful bruschetta is loaded with rosemary roasted tomatoes, creamy ricotta cheese, and salty prosciutto. These are always a hit! Preheat oven to 425°F. Stir 6 tablespoons oil, garlic, rosemary, 1 teaspoon coarse salt, and 1 teaspoon pepper in large bowl to blend. Add tomato quarters and stir to coat. Let stand 5 minutes. Line rimmed baking sheet with foil. Lift tomatoes from marinade and arrange, cut side down, on prepared baking sheet (reserve marinade for toasts). Spread 1 tablespoon ricotta cheese on each toast; sprinkle with pepper. Fold prosciutto halves over and place on ricotta. Arrange 2 tomato quarters atop prosciutto. Whisk lemon juice and remaining 1 teaspoon oil in medium bowl to blend; season with salt and pepper. Add microgreens and toss to coat. Top bruschetta with microgreens. Arrange on platter and serve.